Just in time for ELMF 2014 in Amsterdam, rapidlasso GmbH and Carbomap Ltd. have teamed up to further the development of tools that better exploit full-waveform LiDAR for the forestry and carbon market. This partnership brings together many years of expertise in processing discrete and full-waveform LiDAR with a wealth of experience in applying this technology within forestry and biomass applications. The full-waveform tools are built around the PulseWaves format, an open LiDAR format that is the full-waveform sibling of the venerable LAS format, reaffirming a joint committment to support the use of open data formats within the LiDAR industry. Software will be developed both as stand-alone tools as well as for use within the IDL framework. The use of LiDAR in the forest and carbon industries is expanding rapidly. The new partnership between rapidlasso and Carbomap targets the development of solutions for this growing market. Together the two companies can offer a wider range of tools for vegetation analysis that better exploit the additional information captured by a modern full-waveform scanner, including the newest multispectral instruments. Antoine Cottin (left), CTO of Carbomap, and Martin Isenburg (right), CEO of rapidlasso, discuss technology details about their new partnership. Technology start-up rapidlasso GmbH specializes in efficient LiDAR processing tools that are widely known for their high productivity. They combine robust algorithms with efficient I/O and clever memory management to achieve high throughput for data sets containing billions of points. 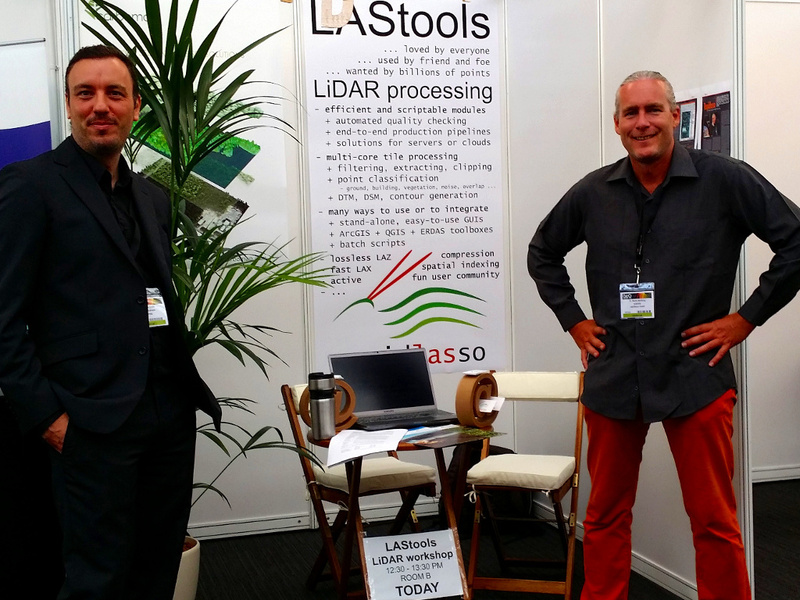 The company’s flagship product – the LAStools software suite – has deep market penetration and is heavily used in industry, government agencies, research labs, and educational institutions. Visit http://rapidlasso.com for more information. Carbomap is an environmental survey company spun out of the University of Edinburgh. The company takes forward over five years of world-class research in the development of a Multispectral Canopy LiDAR, a revolutionary, patent-pending laser scanning instrument designed to fill a gap in airborne forest survey requirements. The founders are international renown for remote sensing methodologies, satellite radar mapping, forest structure mapping, carbon sequestration and airborne survey. Carbomap is currently the only company with tools for analysing multispectral LiDAR for forest applications. Visit http://carbomap.com for more information. This entry was posted in biomass, forestry, full waveform, LiDAR, press releases, PulseWaves. Bookmark the permalink. ← Restricting Access to National LiDAR: Is it worth it?